I guess the proportion of the dark and white chocolate was not right for the middle layer...as I sort of mix and match recipes to come up with this version. The original recipe uses 40g dark chocolate and 40g white chocolate for the middle layer. If I were to make this again, I will change it to 20g dark chocolate and 60g white chocolate. Nevertheless the cheesecake tasted very refreshing and light as I used yogurt instead of whipping cream. Mix biscuit crumbs; melted butter together and press firmly with the help of a spoon onto the base of a 18cm round pan. Chill for 30 minutes. Place gelatin powder and water in a bowl. Heat a pot filled with some water until just simmering and place the bowl inside the pot. Dissolve gelatin and water in the bowl. Keep warm. With a whisk, beat cream cheese till soft. Add in sugar and whisk until smooth and creamy. Add in yogurt and continue to beat till smooth. Blend in gelatin solution and mix well. Divide cheese mixture into 3 equal portions. For the 1st portion, stir in 80g of melted dark chocolate and spread evenly on the biscuit base. Chill in the fridge for a while. (I pop it in the freezer while preparing the 2nd layer). For the 2nd portion, stir in mixture of 20g melted dark chocolate and 60g melted white chocolate. Spread over the 1st layer. Chill in the fridge for a while. For the 3rd portion, stir in 80g of melted white chocolate. Spread over the 2nd layer. Chill for 3 to 4 hours before serving. Tip: You can melt the chocolate in 3 separate bowls, ie 80g of dark chocolate in a bowl, 20g dark chocolate plus 60g white chocolate in another and 80g of white chocolate in a 3rd bowl. Hi Lannie, I think there shouldn't be a problem with using milk chocolate. Thank you. I have another question. How much is 2 tsp gelatin powder? I mean what is the weight. I only can get gelatin sheets in Netherlands. Hi Lannie, 1 tablespoon of gelatin powder is about 9g. You mean I can just replace whipping cream with yoghurt in every chilled cheesecake recipe? This will help my waistline tremendously? I'm always looking for cheesecake that calls for yoghurt instead of cream..
Hi lizziebeth, I don't think you can replace whipping cream with yoghurt for every recipe...I was just being adventurous ;) but it turned out well for this cake. I always look for recipes that calls for yoghurt instead of whipping cream, just like that ribena marble cheesecake. I have another recipe "Blueberry Cream Cheese Tart" which also uses yoghurt. Instead of a tart, it can be assembled into into a no-baked cheesecake using a springform or loose bottom pan. Hope this helps. Wow, you combined 2 of my favor heavenly ! Let me see who is the lucky buddy that I'll make this as birthday cake for. May I know if gelatin needs to be used for every no-bake cheesecake? Is it possible to leave out the gelatin? Also, can cream cheese be beaten manually instead of using an electric mixer? 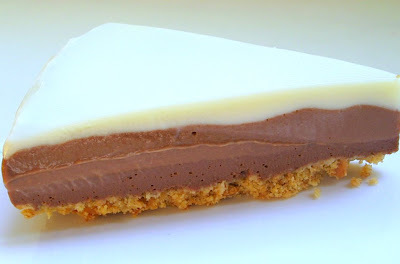 Hi JF, most of the no-bake cheesecake recipes I came across has got gelatin, except for Tiramisu. I guess it is need to give it a firmer texture to be able to slice into pieces. Yes, you can beat the cream cheese manually. 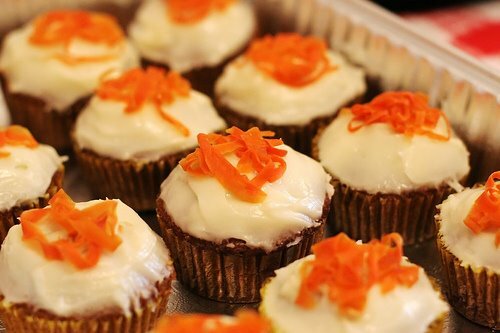 I use a manual whisk to beat the cream cheese for this recipe. Hope this helps. Hi, great recipe which I hope to try over the weekend. One question. Is it possible to substitute some of the chocolate for cocoa powder so I can reduce the calories/fat a little bit? If so, can you give me an idea of how much cocoa I should use? Hi Kaz, I am sorry I do not whether it is ok to replace the chocolate with cocoa powder. Hi HHB. No problem, I just went ahead and tried it with part chocolate, part cocoa powder. It was fantastic so thank you for a great recipe. Low fat cheese, and low fat yogurt makes it even better. alina, I use a spatula to spread the surface. You can turn the pan as your spread, it will help to smooth out the surface. do you double boil the chocolate or do you just heat it up over the fire? also what brand of chocolate would you recommend? alina, I double boil the chocolate. I either use carrefour's dark chocolate, their house brand for baking or dessert making, or Hershey baking chocolates. thank you!! (: sorry i keep asking so many questions..
i just popped by ntuc and couldn't find white baking chocolate.. :/ i only saw dark and milk. is it really necessary to use baking chocolate in this recipe even though it's a no-bake cake? alina, baking chocolates are more suitable than eating chocolates when used to make desserts or cakes, as they contain higher cocoa content, giving a more intense flavour. I have not used normal eating chocolates to make desserts or cakes, so I am not able to comment whether it will affect the finished cake. Hi HHB, what kind of pan did you use? need to line? How do you take it out without damaging the cake? I tried a no-bake recipe from book and it is very soft. I have problem taking it out..
Hi Joy, you can use a pan with a removable base, it is not necessary to line it. When I made this cake, I didn't have such a pan. I used a normal round pan (with base). I lined the base of the pan with two long thick strips of parchment paper. When the cake was set, I lift it out of the pan by holding to the strips of parchment pape. You need extra pair of hands to help lift it out. Hope this helps. Hi HHB, how long do you have to chill each layer of chocolates in the freezer? Hi, I chilled it in the freezer for about 10-15mins.